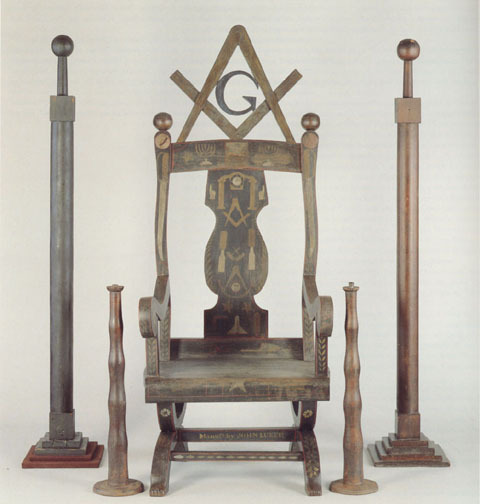 MASONIC CHAIRS - Antique Worshipful Master Chairs. 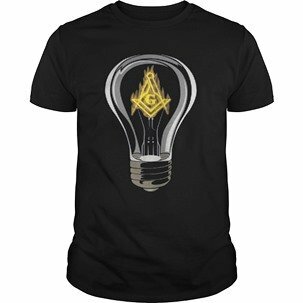 Masonic chairs are an art form unto themselves. 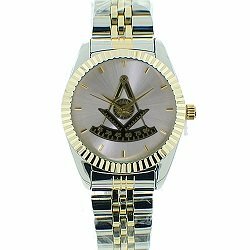 Their Masonic symbols go back in time hundreds of years and are part of Masonic history. 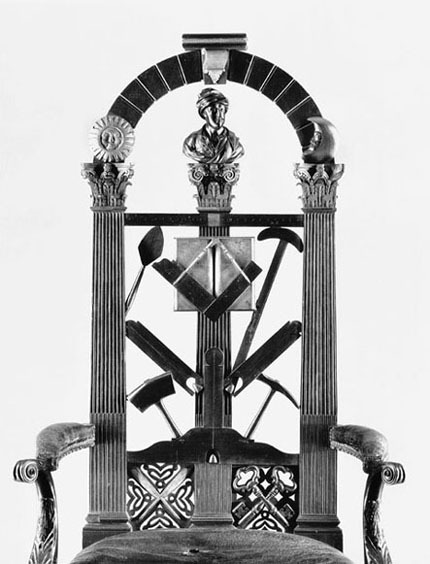 Since Freemasonry is built upon the symbolism of Solomon's Temple on Mount Moriah in Jerusalem, the Master's chair is symbolic of a King's throne. Throughout history, no matter whether these chairs were roughly hand-whittled from logs and branches or lovingly hand carved by a master craftsman and ornately decorated with gold and filigree, the men who have sat in most of these chairs have been elected to and held the most prestigious position in their lodge,...that of the Worshipful Master. Unlike a CEO of a major company who may choose a chair for its prestigious look and its power to make a statement, or a business owner who might choose a Herman Miller Aeron ergonomic desk chair for its comfort and lumbar support, these Masonic chairs have no ergonomic chair qualities, whatsoever. These Worshipful Master chairs have no lumbar support, no tilt mechanisms, no levers and most have very little padding. They don't roll on wheels, do not have extendable arms, mesh seats or backs to keep you cool. In fact, rarely will you ever find one which is for sale. If you do find one for sale, it is typically much more expensive than a top of the line, ergonomic office chair. 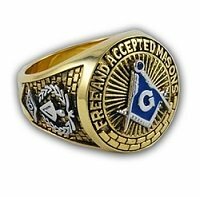 The difference between a successful businessman's empty chair and an empty Master's chair is that the Master's chair is symbolic of the Master's duties and loyalty to his lodge and its members. The men who currently sit in or have sat in these chairs are honorable men who believe in a Supreme Being, universality among men and strive to promote peace and harmony within their lodge and actively support charitable work within their communities. Here are some chair photos and a drawing. Scroll down the page, so you can see their hand carved and highly ornate detail work. 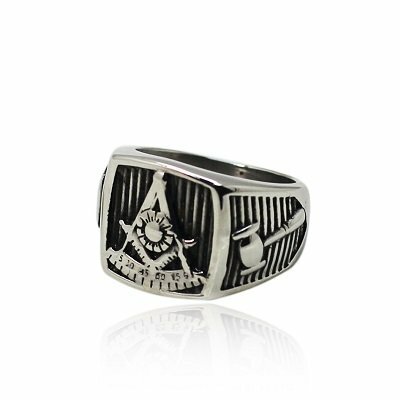 Several of the pictures and images, below are courtesy of Trepanier Lodge No. 83, A.F. & A.M. - G.R.B.C. & Y. THESE CHAIRS ARE NOT FOR SALE. 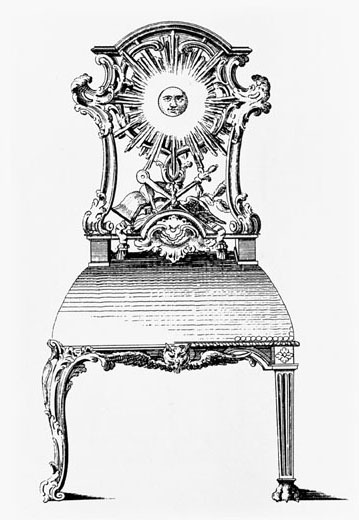 The Pre-Revolutionary Masonic Worshipful Master's chair, below was built by cabinet maker, Benjamin Bucktrout of Williamsburg, Virgina between 1766 and 1777. It is over 200 years old and is made of mahogany with black walnut and has rocaille ornamentation and its original leather seat. It currently resides in The Colonial Williamsburg Collection. 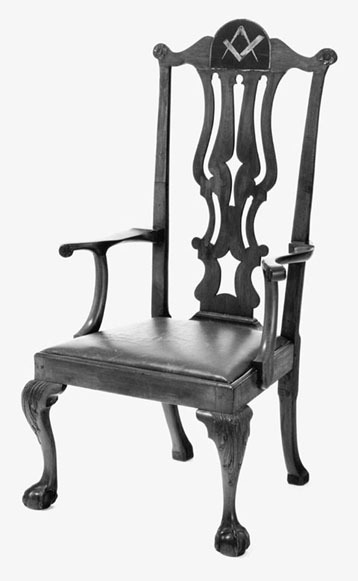 Click on this link and scroll down toward the bottom of the page to read more about the Benjamin Bucktrout Master's Chair. Close up of the back of the chair. After conservation work was completed. 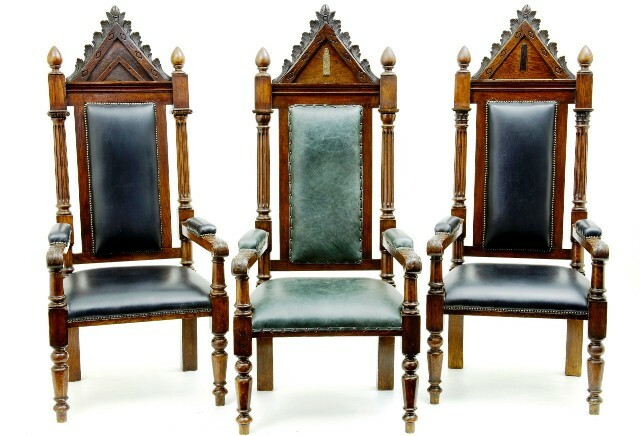 Above, are 3 solid oak, antique Masonic chairs. Drawing of Chair. Notice the different legs. 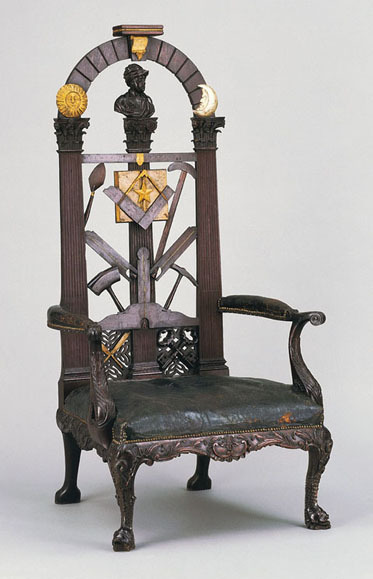 In approximately 1791, soon after the Prince of Wales (later called George IV), became the first Royal Grand Master in 1790, a Senior Warden and Junior Warden chair was commissioned to be used in Freemasons' Hall in London. 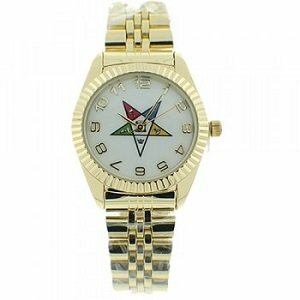 They display columns, foliage, acanthus leaves and the respective symbols of the Senior and Junior Wardens. They are duplicates, except that the Senior Warden's chair has Corinthian columns and a level and the Junior Warden's chair has Ionic columns and a plumb. They have deep blue velvet seats and fluted legs which taper down to brass castors. They are made of limewood which has been gilded. Over the years, the chairs have been repaired many times. They had been re-gilded so many times that their intricate carvings were no longer crisp looking. In 2005 thru 2008, The United Grand Lodge of England commissioned W. Thomas Restorations Limited to restore the chairs. All the previous layers of gilt were carefully removed, repairs were performed to the limewood carvings and they were then re-gilted using a water gilt rather than an oil gilt. 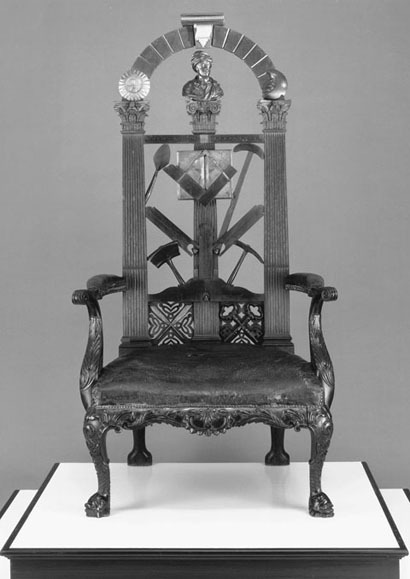 It took the restoration team 3,375 hours to perform the repairs on these 2 chairs and the Master's throne. They used 190 books of 23-1/2 carat extra thick gold leaf. Today, (2013), these 2 chairs are 222 years old...and are breathtakingly beautiful and bespoke. To see their details more closely, once you click on the links, press your "Ctrl" key and your "+" key (to the left of your backspace key) on your keyboard to zoom in. Here is the Senior Warden's Chair. Here is the Junior Warden's Chair. If you enjoyed this page and would like to share it with others, just click on the Facebook icon to 'Like' it on your Facebook page or 'Tweet' it on Twitter.